This salad packs a punch. You can temper the intensity by using fewer anchovies or cutting back on the olives — or, if you dare to add more zing, you could sprinkle chopped red onion over the salad. 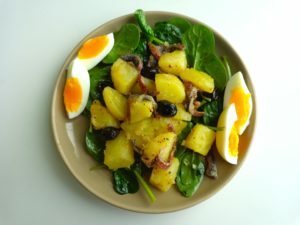 The potato-anchovy combo may be set on a bed of baby spinach leaves, as shown above, or with other tender leaves, for example arugula or Boston lettuce. For best results, use potatoes that will remain firm when boiled. If you don’t have a spice grinder, the coriander seeds may be crushed with a mortar and pestle or ground in a coffee grinder. The egg quarters make a nice addition, but aren’t essential. In season, small tomatoes would make a nice substitute. The quantities below will serve two people. Peel the potatoes, cut them into large cubes and steam until tender, about 15 minutes. Alternatively, you could boil the potatoes whole and cube them afterwards. While the potatoes are cooking, mix together 1 tsp. lemon juice and 1 tbsp. olive oil in a medium bowl. Add the ground coriander seeds and grind in some black pepper. Pile the potatoes into the sauce while they are still warm, and stir gently. Slice the anchovy fillets in half lengthwise, then slice the strips in half crosswise. Add the anchovy pieces and black olives to the potatoes. Stir. Now boil the eggs. For perfect yellow-orange yolks, place the eggs in a pot and cover them with cold water. Set the pot over high heat. As soon as the water boils, check the clock. Boil for exactly 5 minutes, then remove from heat, tip out the hot water, run cold water into the pot to cover the eggs, tip out again and refill with cold water. Let the eggs sit for a couple of minutes, then peel them and slice into quarters. While the eggs are cooking, mix the remaining 1 tsp. of lemon juice and 1 tbsp. oil together in a separate medium bowl. Peel and mince the garlic, and add. Grind in some black pepper. Add a dash of salt, but go easy as the anchovies are already very salty. You can stop at this point and assemble the salad just before serving. When ready to serve, add the spinach/tender leaves to the second bowl and toss. Place on individual plates, pile the potatoes on top and decorate with the egg quarters. Serves two.